Some family friends made this a couple of years ago for a gathering, and it has become a spring/summer go to for our family every since. 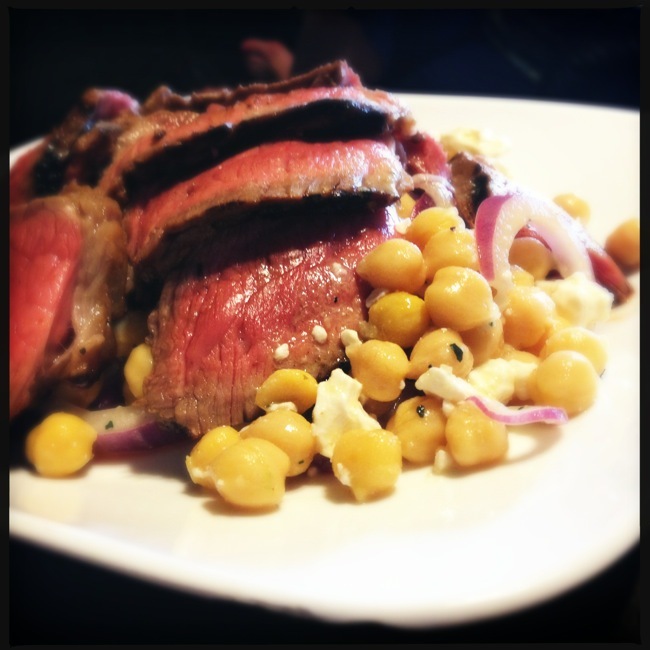 A nice salad of chickpeas, thinly sliced red onions, and feta cheese is dressed with a spicy vinaigrette and topped with thinly sliced medium-rare steak. This can also be made with lamb instead of beef if you prefer, which I sometimes do. Even the kids love this one, and how can a fatboy go wrong with steak on a salad? Thinly slice steak against the bias to improve tenderness. Place thin slices of steak over the top of salad and serve.